Before setting up your adapter, make sure that the Linksys Wireless Adapter is NOT plugged in. Click Click Here to Start to begin the installation process. Plug the Wireless-G USB Adapter into your computer and click Next. The Linksys Wireless Network Monitor should automatically appear. Select the name of your wireless network or SSID and click Connect. If you want to configure the adapter manually, click Manual Setup. 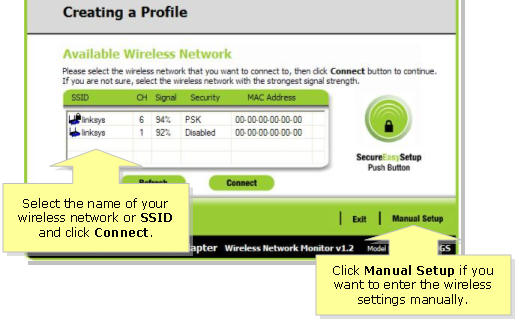 If the Linksys Wireless Network Monitor did not appear, you have to configure your adapter manually. Note: To check if the drivers were properly installed, check if the Linksys Wireless Network Monitor reports that the Adapter is Active. For instructions on how to do this, click here.